Kleenoff Pro is the professional brand of ECS Ltd and the range delivers a broad depth of entry level and premium quality cleaning solutions for the demanding professional user. ECS has over decades of experience in the professional marketplace. The Easy and Kleenoff name continues to be a hallmark for hygiene as the Professional and Catering Division goes from strength to strength, serving the needs of professional customers. Kleenoff Professional is a range in which we continue to develop premium quality formulations to meet the ever increasing demands of the professional marketplace. 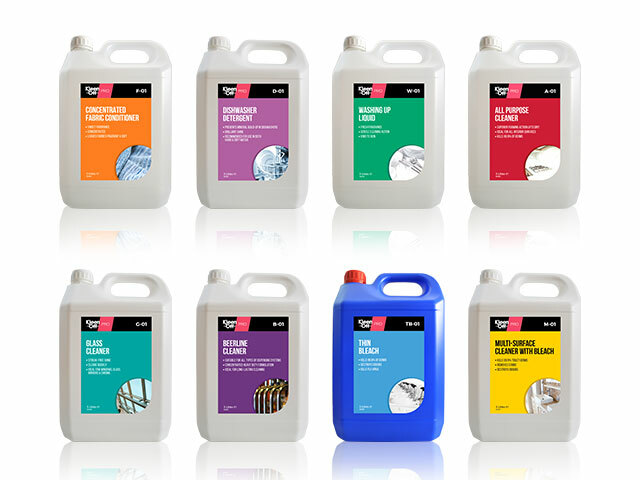 All product labels are colour and number coded for ease of identification and clear purpose of use for the end user. The current range offers hygiene solutions for all areas of professional requirements including catering, washroom, laundry, and many other areas. The range is growing with new and innovative products continuously being brought to the market to satisfy our customers’ requirements.